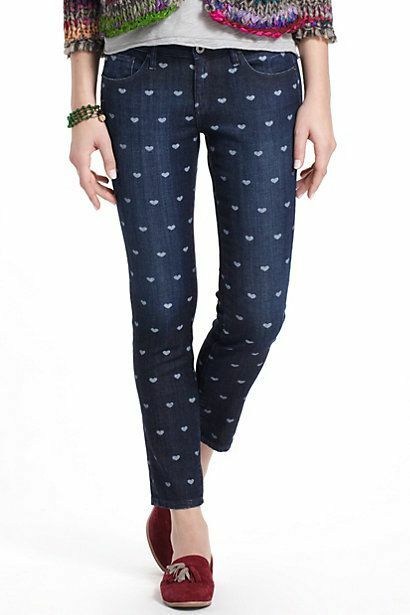 Remember the print jeans trend?!? This tutorial's a long time in the making, unfortunately for me... I decided to make these in September or October!! Finally finished them and am ready to share with you. So I decided I liked the print jeans trend (I haven't worn basic skinny blue jeans in ages, favoring colored or black or grey ones! 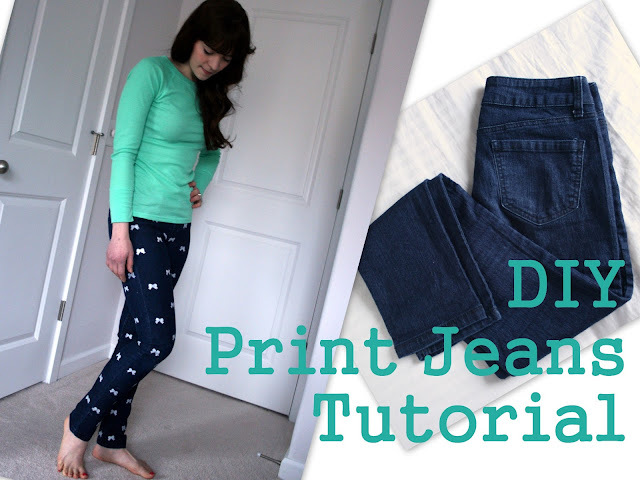 ), but even with cheap print jeans being pretty easy to find, I wanted to make my own. As is my way. ;) I remembered the wonders of freezer paper for making your own fusible stencils, and I still had a big roll from my last crafty DIY stencil project yeeeeears ago. So I just needed a pattern! Anyway. Ready for the tutorial? Jeans or whatever you want stenciled! Plastic or heavy paper to go in between the front and back of the jeans. I used huge paint swatch cards! 1. Cut your freezer paper into squares or rectangles that are larger than your hole punch shape. I cut long strips, then cut them into square-ish shapes. 3. Iron your freezer paper rectangles, shiny side down, onto one side and leg of your jeans (i.e., back of left leg). I chose to put mine in a regular pattern, like a diamond/X shape. You could go random if you wanted, I bet! Or keep it regular. I followed the grain of my jeans to keep them all straight up and down. 4. Without bending the jeans around too much, you'll use your craft paint (mix it with fabric medium to make it bendier when dry) and sponge brush to pat the paint onto the exposed areas of each paper rectangle. ! !Be sure to insert your heavy paper, cardboard, or plastic into the leg before you do this--it will bleed through!!! 5. Wait to dry... that craft paint is FAST, though. I did two coats on all my bows, but it dries in only 5 or 10 minutes, I think. 6. Once dry with all your coats, do the other side or other leg. That's why these took me so long... I did the first 3/4 of them in early December but hadn't had time to do the whole ironing board/stamping on the floor business since then. Then, finally, I decided it was time. Got these babies off my ironing board pile and finished the back right side or whatever. But, now they're done! Ta-da!! My husband thinks they're super cool. Thanks, babe. Note after wearing--the paint looks a little crack-ey on some bows; not like it's going to come off, but just a little stretched. These are not-super-stretchy-but-still-stretchy jeggings, so on super stretchy pants I can see that being more of an issue. Hence needing the fabric medium to mix with your paint. Or, do it on heavier, non-stretchy jeans and you'll be fine! Those are SO CUTE!!! I have to try that. I am thinking about hearts for valentines day. They look great, I love the bows! I would probably have never finished the project. I'm so terrible at finishing time consuming things if I have to stop in the middle. These are great - such a simple idea but so effective! Good for you... If I don't finish a project in one run then I never pick it up again. My craft room is FILLED with a ton of unfinished projects. The bows look GREAT! Those look amazing. I don't remember the fad myself but I do hope it comes back because I love it! This is a fab idea, I might have to try it! Very cute, I like your choice of bows! Great idea, take a note! They look fabulous! Nice job! I love these, I have to try this. Love this idea! I've tried making polka dot leggings. It worked okay. But this looks fool-proof =D Very cute! these are pretty fantastic! I will have to attempt it! great post. 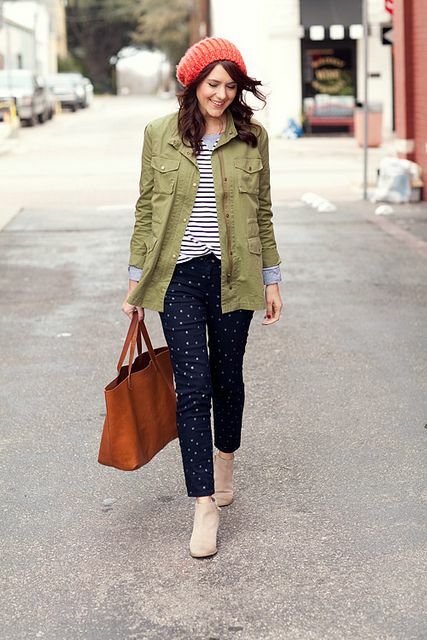 I saw those same jeans at anthro and said, I can do that! I'm glad you did too! So cute.